"There's no better way to use up rhubarb!" Combine 2 cups flour, brown sugar, baking powder, and salt in a bowl. With a pastry blender, cut in the margarine until the mixture resembles coarse crumbs. Stir in the evaporated milk and beaten egg. Press the dough into the bottom and partly up the sides of a 9x13-inch baking dish. For a thicker crust, press the dough into the bottom of the pan only. Mix the rhubarb, gelatin mix, and 1/2 cup of white sugar. Spread the fruit over the dough. Combine the remaining 1/2 cup white sugar, 1 cup of flour, and softened butter in a bowl. Cut in the butter until the mixture resembles coarse crumbs. 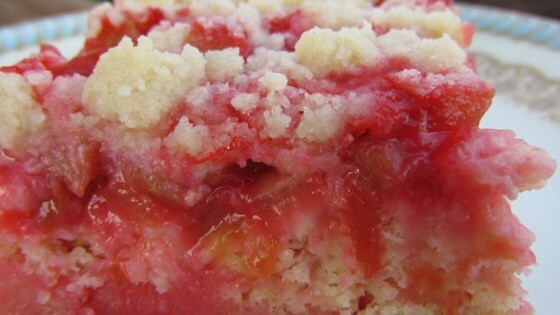 Top the rhubarb with the streusel mixture. Bake in the preheated oven until the topping is golden brown and the filling is bubbly, about 45 minutes. You can substitute strawberry gelatin for the raspberry, if you prefer. Making the crust can also be done in a food processor. In Step 1, pulse the margarine and flour mixture in food processor until it's the size of small peas. Turn mixture into a bowl, and proceed with recipe. I used sugar free jello was all I had it didn't taste as good maybe try it with regular jello next time. Great! Will make it again. Just had to add about a cup of raspberries as I ran out of rhubarb—?? There is no amount of salt in the recipe? I make a lot rhubarb desserts in the Summer, but for some reason this dessert just didn't wow us! Hubby is the only one eating the remainder of the cake.